In 42 Rules of Sensible Investing, Leon Shirman shares his practical insights on personal investment strategies and philosophies, and on picking winning stocks. These views are heavily influenced by successful long-term approaches used by modern investing legends, such as Benjamin Graham, Warren Buffett and Peter Lynch. The sometimes complex and esoteric strategies are transformed into concise, practical, and sensible rules. How to stay calm in declining markets. How to have a good selling strategy. Why index funds perform better than most other actively managed funds. How over-diversification can be a bad idea. Why long term, investing in stocks is less risky than in bonds. Why it makes sense to stay invested at all times. How simple process of stock picking is better than a complex one. “This book condenses enough wisdom into these 42 straightforward rules to save investors years of learning through costly experiences”. 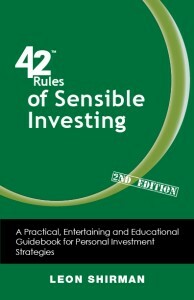 “42 Rules for Sensible Investing is a clear, easy to read, objective and balanced review of the basic fundamentals of investing. It is ideal and essential for the novice and a helpful reminder for the experienced investor”. “The book provides a great summary of investment techniques in concise and understandable form. A must read for anyone who doesn’t have time to go through voluminous tomes on investing”. “Valuable and actionable advice for both novice and experienced investors delivered in enjoyable and easy to read manner”. More information available from the publisher and from Amazon.